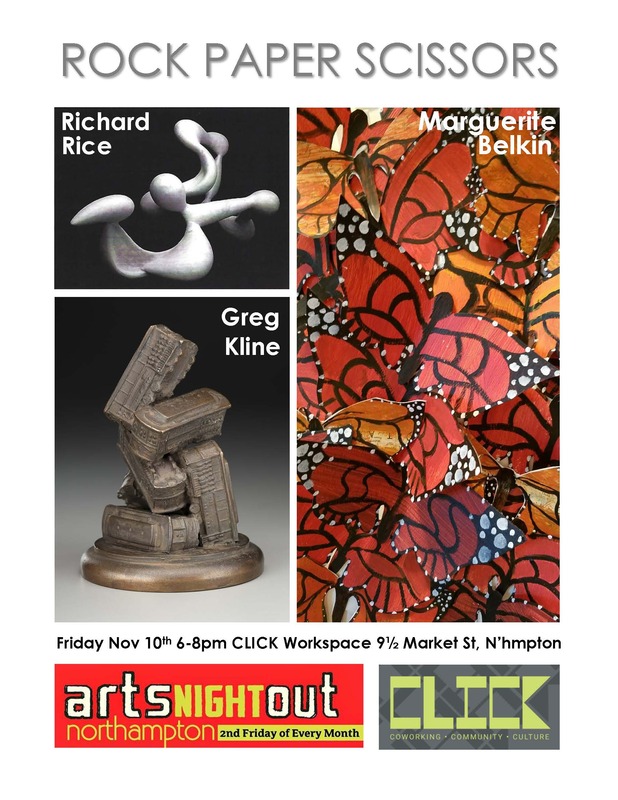 A group show featuring Richard Rice (“rock”), Marguerite Belkin (“paper”), and Gregory Kline (“scissors”). Richard Rice is a Northampton-based sculptor. He holds an MFA in sculpture from the Graduate School of Fine Arts at the University of Pennsylvania and studied Italian Medieval and Renaissance sculpture during a residency in Tuscany. Richard has worked as both an independent sculptor and a psychiatrist and psychotherapist since the 1970s. His artistic work garnered an Arts Lottery award from the Massachusetts Cultural Council, and his work has been featured in numerous exhibitions throughout Massachusetts and beyond. Marguerite Belkin is an Easthampton-based paper sculptor who began her career as an origami jewelry artist in Houston. She created unique paper jewelry which was sold at a number of local and regional galleries throughout Texas. Later, she transitioned to creating whimsical painted paper and recycled book sculptures which have been shown and sold at a number of regional and national venues. Marguerite’s latest work is a 700 piece installation titled im·Migration. Three different animal migratory patterns serve as metaphor for the struggles of people seeking sanctuary in different parts of the world. “Flight to Canada” on Click’s stairwell depicts a flock of 100 geese flying north toward a warm Canadian welcome. In “Unchartered Waters” a school of 200 fish navigate a storm tossed Mediterranean to find shelter near the Greek Islands. “Over the wall” shows 400 monarch butterflies finding their way from Mexico to the U.S. despite whatever obstacles are put in their path. I·igratio was created to celebrate the indomitable spirit of those who escape their homeland and overcome hardships in their determination to find a new and better life. Gregory Kline describes himself as “an artist, maker, collector, hoarder, daydreamer, mudlark, tinkerer, and a scavenger of kitsch.” His current body of work attempts to further reconcile his relationship with the objects he chooses to compulsively surround himself with. He makes objects that play with history, conventions, and paradigms through humor and satire. The works are cast in bronze from molds made from an archive of hundreds of objects in his collection.